Crock pots make life easy. Load up your meat, vegetables, and any other ingredients. Turn on and let it cook all day while at work or ushering kids around. 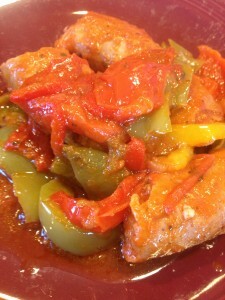 Crock pot Italian sausage, peppers, and tomato sauce. The best part is it is ready and warm when are you are ready to eat! Wash the peppers, core, remove seeds, slice and dice. 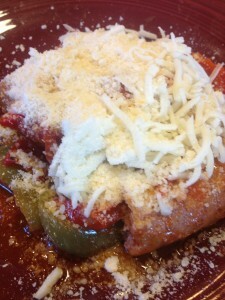 Put peppers, sausage, and sauce in crock pot. Set on low for 5-6 hours. Go to work, run errands, or just plain live life. Come back in 5-6 hours and your meal is ready. Top with parmesan and or mozzarella. Dunzo! Double potato egg bake with two types of potatoes, onions, and peppers. 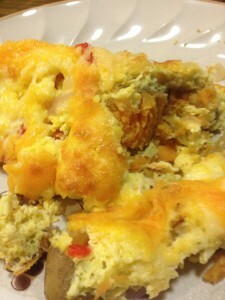 Egg bakes are a great way to make breakfast for a few day via leftovers at one time. Great to do on Saturday or Sunday morning. Crack eggs and put in mixing bowl. Whip or mix the eggs…same thing you would do if making scrambled eggs. Wash, core, remove seeds, slice, and dice the pepper. Saute pepper and onion in 1 TBS of butter. Wash all potatoes, microwave potatoes. Slice potatoes in thin strips. Coat oven safe baking dish or cast iron frying pan. Layer the potato slices on the bottom of the pan. Place onions and peppers on top of the potatoes. Pour eggs on top. Top with cheese. Back at 350F for 25-35 minutes. Dunzo! Foldit Left Over Chicken and Pepper Pizza. There are some many variations of high protein pizza using Foldit’s and Flat outs. 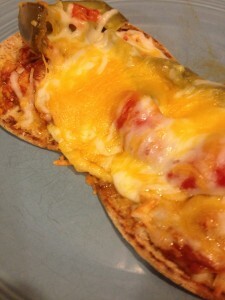 This is just one more using left over crock pot chicken and peppers. Preheat oven to 320-350F. Place Foldit on pizza stone. 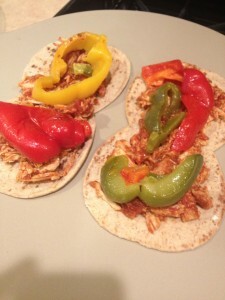 Stop with left over chicken, peppers and cheese. Cook for 10-15 minutes. Dunzo! High Protein waffle cakes. Kids love these. 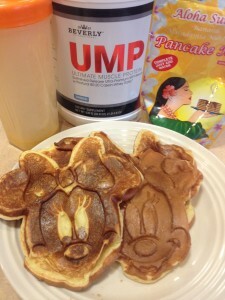 Combine some regular pancake mix with and egg and protein powder. Better yet make a few dozen and freeze them to eat later. This is not only less expensive but you can control what is in your kids breakfast. Simple take from the freezer, drop in the toaster and eat. Combine all ingredients in gravy or protein shaker. The blender bottle works fabulous for this. A thick consistency is desired. Pour into waffle iron and Dunzo! Energy Drinks as bad as “THEY” say or no worse than many things consumed? Low Carb or Low Fat Which is Better for Weightloss? Harvard Study and More! Milk, Dairy and Prescription Drugs…How Many are You On? Fat Loss Fact and Folly? The Reason You are NOT Losing Weight, Your Cardio is Part of it!